A bowl of wonton soup is so hearty that I can eat one at any time of day and in any season of the year. 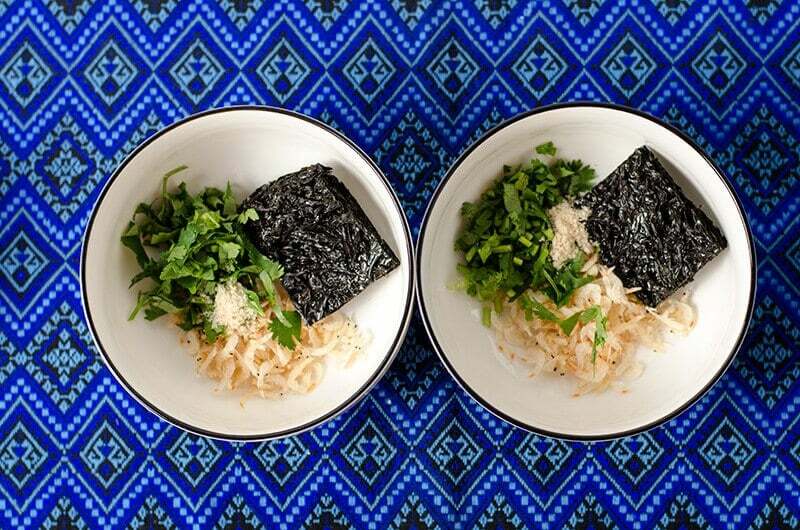 Even though the dish looks intimidating to make, it is surprisingly easy once you try it out. There are many ways to prepare wonton filling and soup. 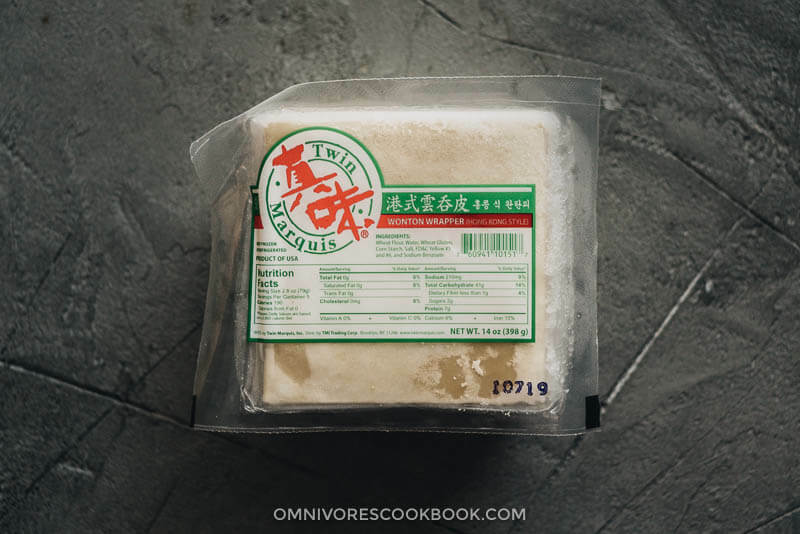 For example, you can use ground chicken to make chicken wonton soup, use ground beef to make beef wonton soup, or add noodles into the soup to make Cantonese-style wonton noodle soup. You can even use hot sauce as a base to make Sichuan-style spicy wontons. In this post, I want to introduce the most basic and classic version – it uses ground pork, shrimp, ginger, green onion, soy sauce, and a drizzle of sesame oil to make a rich and flavorful filling that tastes so, so good. This is how we Northerners make wontons. We like to add plenty of aromatics and seasonings to make the filling very rich, so the wontons taste great, even by themselves. In a Chinese kitchen, home cooks always hand-chop all the ingredients. This is because most Chinese families do not own a food processor. Plus, many people enjoy the texture that is made by hand chopping. If you want to make the prep easier, you can totally use a food processor or a blender to mix the filling. In this case, you can simply slice the ginger and green onion into coarse pieces. Add all the filling ingredients except the shrimp into a food processor. Process until it forms a silky paste. Then add the shrimp and blend until the shrimp are finely chopped, but do not turn into a paste. There’s a good chance that the wrapper will not be sticky enough and you’ll have trouble pressing the ends together. To solve this problem, you can brush some water onto the edges of the wrapper with your finger, so the wrapper will stay together while cooking. Here is a short video I made to show you four ways to wrap wontons. I introduced two types of wonton broth in the recipe below. My old wonton soup recipe (published May 26th, 2014) introduced a traditional Chinese street vendor style soup base. 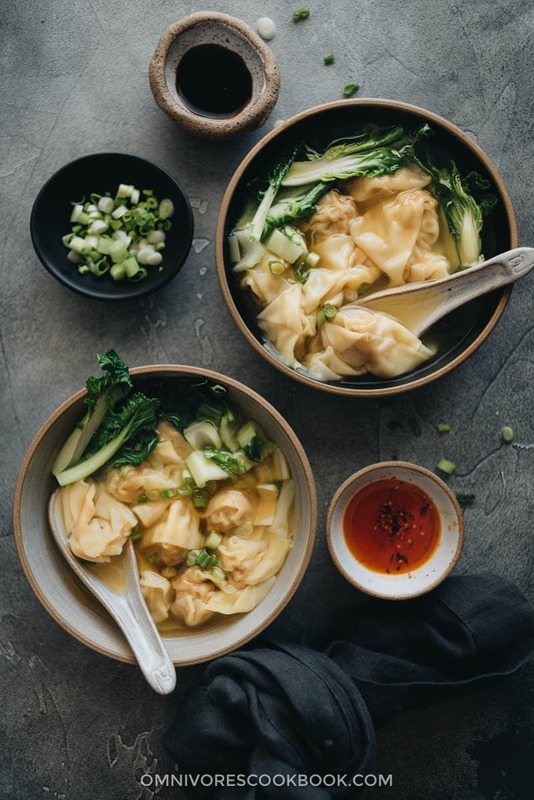 It uses papery dried shrimp, dried seaweed, a bit of chicken bouillon, some soy sauce, and a touch of sesame oil to turn the wonton boiling water into a simple and tasty soup that’s full of umami. However, after moving to the US, I did find it more difficult to find the ingredients to make the Northern-style soup. That’s why I added another chicken-broth-based soup base with easy ingredients that you can get in most grocery stores. Once you’ve wrapped the wontons and made the soup, all you need to do is boil the wontons and assemble the bowls. 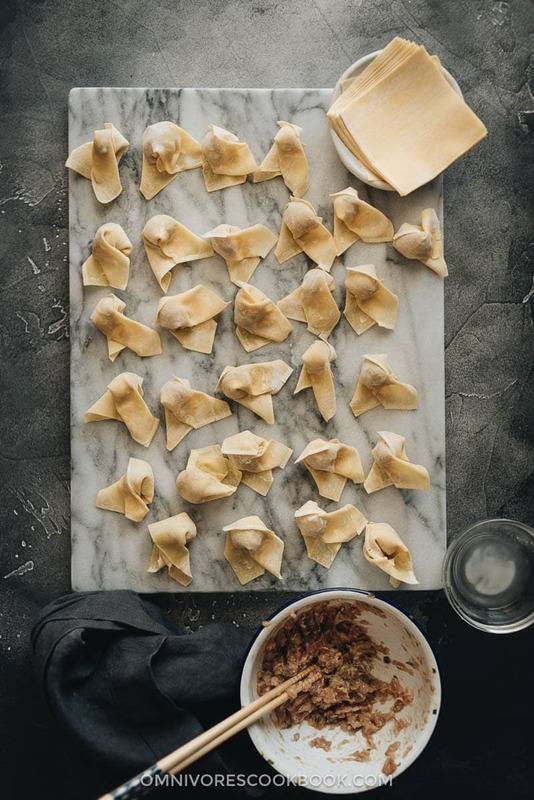 I love to wrap my wontons in a big batch and freeze them in small portions, so I can have freshly made wonton soup ready in 5 minutes on a busy weekday. Always use the square-shaped wrappers that are designed for making wontons. I love to use the Hong-Kong-style wonton wrappers, because of their beautiful yellow color. I always use the brand shown in the picture below when I can find them. 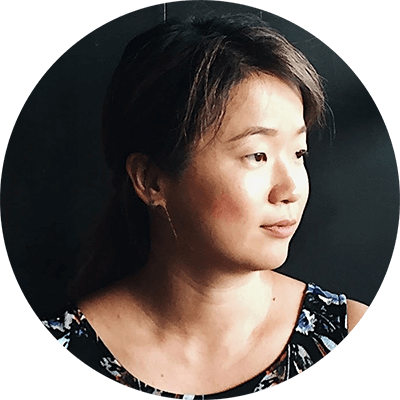 I avoid using wonton wrappers that are too small (if edge is less than 3.5” or 8.5 cm) or too thin (the type sometimes labeled as for wontons or shumai), because they can be difficult to work with and fall apart easily. 2. Why does the filling look wet? When you add all the filling ingredient into a bowl, it might look like you’ve added too many liquid ingredients. Do not panic! This is one of the traditional Chinese ways to create a juicy filling, by beating liquid ingredients into the meat. You should mix the ground meat in a circular motion until it forms a paste that is sticky and spongy. This means the liquid is well absorbed by the meat and the filling is firm enough to wrap. The wonton cooking time can be a bit tricky to put a number on because it can vary a lot depending on the wonton size. In general, you want to keep an eye on the pot while cooking. Once the wontons float to the top, cook 1 to 2 minutes for small wontons, and 2 to 3 minutes for bigger wontons. The wonton wrappers should look semi-transparent. If a lot of wontons start to fall apart, it might mean you’ve cooked them too long. Transfer them to a bowl immediately. Always taste a wonton before you serve them. The best way to serve wonton soup is to boil the soup base and the wontons fresh, and serve them immediately after cooking. If you assemble a wonton soup but don’t finish, it will stay well in the fridge for a day. But the longer you keep it there, the mushier the wontons will become. I understand that you might not want to cook a giant batch of wontons every time. That’s why I always recommend freezing the wrapped wontons and cooking them when you plan to serve them. (1) Boil the number of wontons you plan to serve: 5 to 6 to serve as an appetizer, 10 to 12 to serve as a main dish. (2) For each appetizer-sized serving, boil 1 cup of soup. For each main-sized serving, boil 2 cups of soup. (3) Adjust the serving size in the recipe below – if you click on the number of servings, it will show a slider. You can use the slider to adjust the serving size, and the ingredient quantity will change accordingly). Then you can see the quantity you need for each ingredient that goes into the soup base. Note, wonton soup base is quite flexible and you can adjust it according to your taste. Add another drizzle of soy sauce if it’s not salty enough. You can also add some homemade chili oil to spice it up! Phew! That’s everything you need to know to make a bowl of authentic wonton soup! I made a short video to show you just how easy it is. The video is slightly different from the recipe below because I recorded it a long time ago and it only contains the street-vendor-style soup base. But the cooking process is the same. Without a food processor: Combine ground pork, shrimp, ginger, green onion, soy sauce, Shaoxing wine, salt and sesame oil in a big bowl. Mix well with a fork until everything combines well together and the mixture feels a bit sticky. With a food processor or a blender: coarsely chop the ginger and green onion. Add all the filling ingredients except the shrimp. Mix until it forms a silky paste. Add the shrimp and blend again, until the shrimp are finely chopped but don’t become a paste. 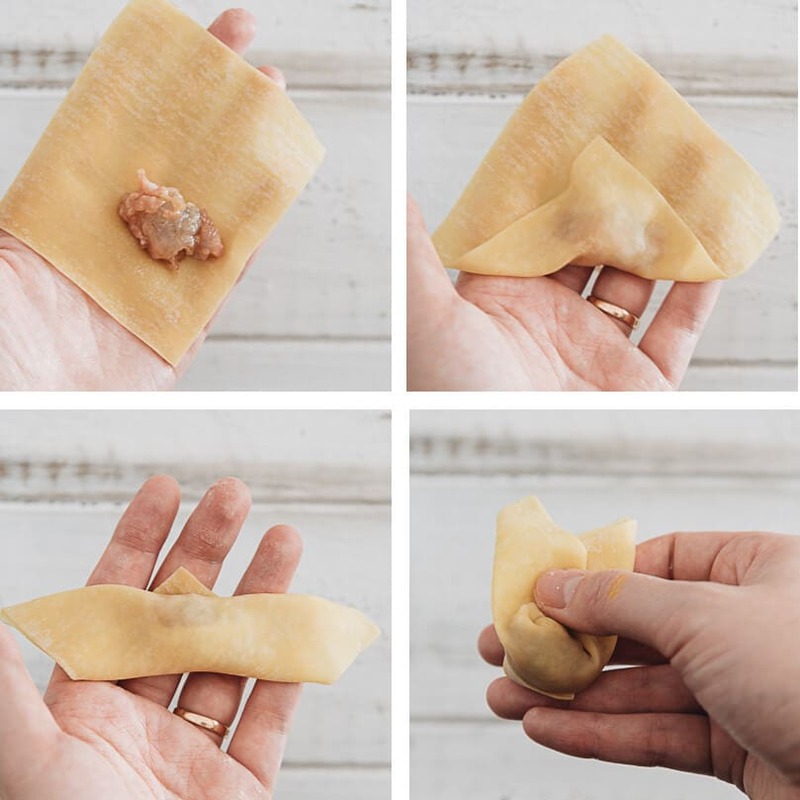 To make wontons, place a wonton wrapper in one hand, scoop a teaspoon of wonton filling and place it near the narrow side of the wonton wrapper (you can add more filling to the wonton if you like, as long as you can still wrap it). Fold the narrow side over the filling, then roll the filling all the way through the other side of the wrapper. Bind both ends and press together to lock the filling inside the wrapper. Brush a thin layer of water onto the wonton wrapper and press the ends together. Make one wonton at a time, and line up all the wontons on a big wooden cutting board. If you aren’t going to boil the wontons immediately, use a damp paper towel (or cheesecloth) to cover the wontons to prevent them from drying out. If you aren’t going to boil the wontons the same day, place them in an airtight container with several layers of wet paper towels on the bottom. This way, they can be stored in the fridge for up to 2 days. Combine the chicken stock, ginger, and soy sauce in a pot. Bring to a boil. Let boil for 10 minutes. Turn to lowest heat to keep warm and start cooking wontons (see below). Prepare 6 large bowls. Add the cooked wontons and bok choy. Add 2 tablespoons green onion, 1 tablespoon soy sauce and 1/2 teaspoon sesame oil into each bowl. Pour in 1 and 1/2 cups hot broth. Garnish with cilantro and chili oil, if using. 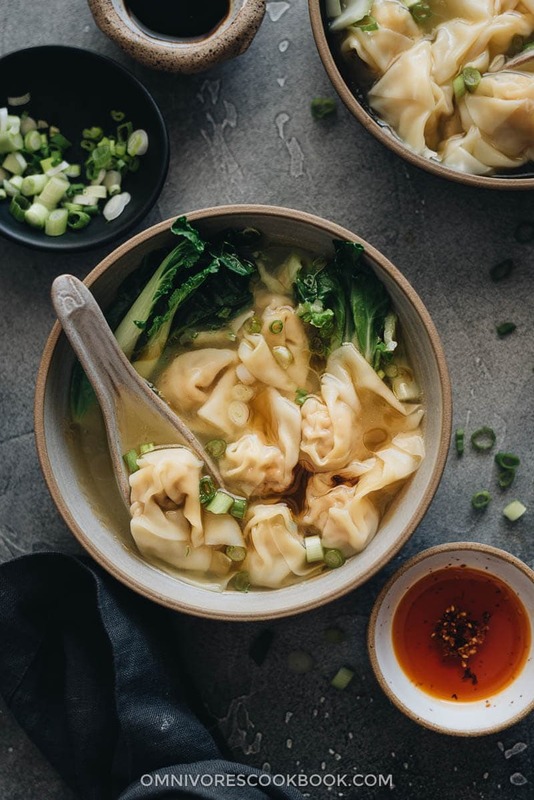 To prepare 1 serving of wonton soup base, add a big spoon of cilantro, 1 tablespoon papery dried shrimps, a generous piece of dried seaweed, 1/4 teaspoon chicken bouillon, and some baby bok choy into a big bowl. Repeat the process to prepare the rest of the soup base in the other serving bowls. Cook wontons (see below). 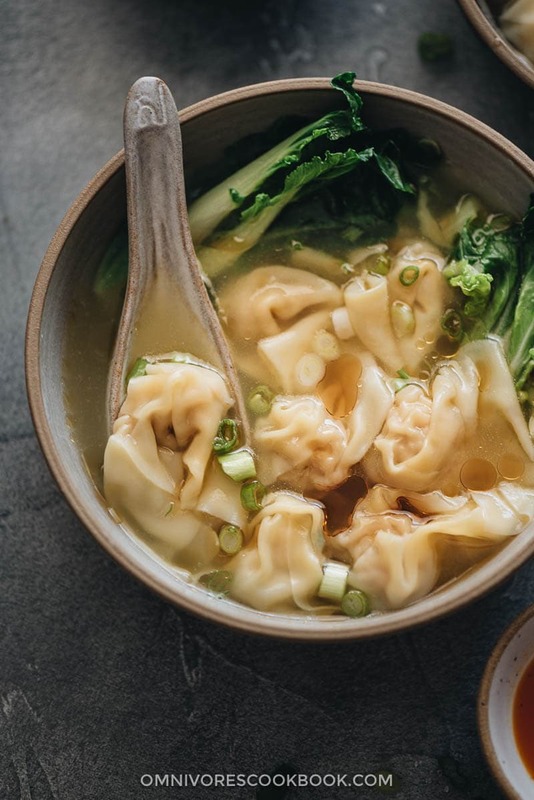 To make 1 serving of wonton soup, use a ladle to transfer cooked wontons, bok choy, and the hot soup into a serving bowl with all the ingredients from the previous step. Drizzle 1 teaspoon soy sauce and 1 teaspoon sesame oil into the bowl and give it a gentle stir. The soup should be amber-colored. Add extra soy sauce or salt if the soup is not salty enough. Scatter green onion on top. Garnish with cilantro and chili oil, if using. To boil the wontons, heat a big pot of water until boiling. Add 10 to 20 wontons at a time and boil over medium heat until wontons are floating on the surface of the water. Continue to boil until the wrappers are swollen, around 1 to 2 minutes for small wontons and 2 to 3 minutes for bigger ones. Take a wonton out with a slotted spoon and split it with a chopstick or fork. If the wonton is cooked through, stop heat immediately and transfer the wontons to individual serving bowls. If not, continue to boil until cooked through. Once you’ve cooked the wontons, add the bok choy. Let cook until tender. Remove from the pot, drain well, and set aside. Bring a large pot of water to a boil over high heat. Add wontons. Stir gently to prevent from sticking. Cook until bringing the water to a boil again. Turn to medium-low heat. Cover the pot with a small gap on one side, to prevent spilling. Continue boiling for 2 minutes (3 minutes for larger wontons). Stand beside the pot the whole time to monitor the broth. If the broth starts to spill, uncover and stir, and replace the cover. Uncover and continue cooking for another minute, or until the wontons are cooked through. There are many types of dried seaweed. My original recipe used a type of instant seaweed that will rehydrate immediately once placed into the hot soup. There are other types of seafood that require some soaking before using. Read the back of your package and follow the instructions accordingly. The nutrition facts for this recipe are calculated based on 1 bowl of chicken-broth-based soup containing 10 wontons. The post was originally published on May 26, 2014 and updated by June 13, 2018. This looks amazing, Maggie! Really not that difficult. My boys and Naomi would LOVE this, so I will have to try it someday soon! Thanks Matt! If you can’t easily find the dried shrimps and seaweed, try to use chicken broth with some vegetables and mushroom for the soup base. It’ll be lovely and soothing dish for family dinner 🙂 Enjoy! Maggie, this wonton soup is wonderfully. So familiar and yummy. I have not make wonton soup for some days because it is really hot now. But I do miss the soup. The video is very comforting! Thanks Prash! I love soup too for any season. Sometimes I store a lot of leftover wontons in the freezer and eat a lot. It’s just so convenient for dinner! Oh Maggie, your wonton soup looks beautiful and delicious! Thank you for the video it makes it so much easire to follow the recipe. Maggie, this is such a beautiful, fun, flavorful soup! I pretty much only deep-fry wontons at home, but I love them in soups at restaurants so this is an obvious choice. Thanks for sharing the recipe! Why are restaurants wontons taste better and the skins stay together better, mine become gummy inthe soup. What’s wrong? Hi Vinnie, Restaurant tends to use freshly made wonton skins of the day, especially hand made wrap instead of machine made one. From my experience, the wonton wrap rolled by myself stay together better. If wontons have been frozen once, the skins are more easy to break during boiling. One more important thing is, never boil wonton for too long time. They are very easy to cook through, then the skin will start to dissolve. 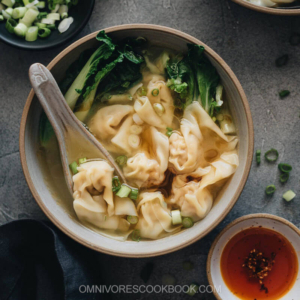 I just had a reader ask me if I knew of any easy won ton soup recipes so I immediately came here and found this fabulous recipe. Now I’m going to make it, too. I love how you give such great directions and take the fear out of cooking! Hi Maggie, did you make the wonton wrapper? The shape are not square as I find in store. Your wonton soup looks wonderful.. Thanks for sharing the recipe. You can use the squared one to make this recipe just fine. Happy cooking! The best wonton we have ever had. We have our own goat herd, so naturally all our meat is goat. 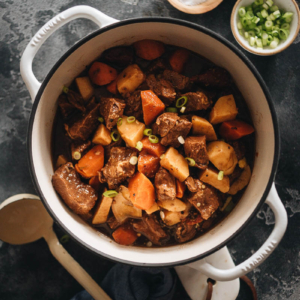 This soup was just another way to incorporate our meat. Was a huge hit. Very easy to make, took no time at all to make the lil wontons. Added bonus they fried up real nice as a quick appetizer and we used the orange sause as the dip! Hi Janet, I’m so happy to hear you tried this recipe and liked it! Goat meat wontons? Wow, that sounds super delicious! Now I’m feeling hungry. And I love the idea of frying the wontons and serve them with the orange sauce. YUM! I just happened upon your website and will be making some wonton’s tonight. Thank you so much for your wonderful recipes. I can’t wait to try making your wonton soup, however was wondering if you could tell me what I could do to substitute the prawns in the wontons as unfortunately I’m allergic to shellfish. Hi Jenny, you can replace the water with chicken broth and skip the little shrimps. It still makes a very delicious soup. Happy cooking and hope your wonton soup turns out great! Thanks for this. I love won ton soup and have been searching for ages for a good recipe. Hi Mark, I think the problem is caused by the spring roll wrapper. They are cooked dough sheet that is designed for deep frying. The dough won’t able stick together in boiled water. The wonton wraps are raw dough sheet that stays much better together while cooking. 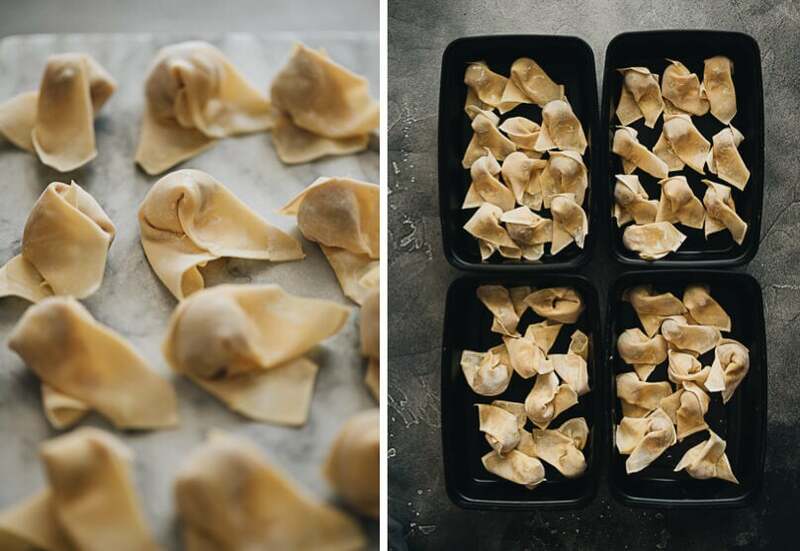 Will you be interested in learning how to make the wonton wrappers at home? I’ll love to share the recipe sometime. Wonton soup is one of my favorite soups ever. I’ll eat it any time of the year, hot or not. I love your video on the way to make wontons. I’ve never been a good wonton maker, and this makes it so easy. So many great tips in this post! This is the best wonton soup I have ever had!!!! Thank you!! It was fun to make!! Thank you again!! So delucious!!! 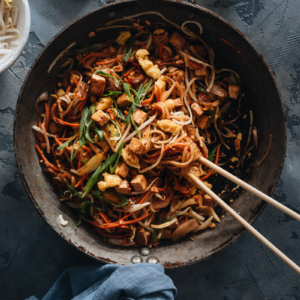 This is my favorite chinese food,I’ll definitely make it asap!thanks for sharing! Just to clarify, you do not cook the pork, shrimp, or chicken before putting it into the won ton? Hi Anecia, yes, the ingredients of the filling are raw when you add them into the wontons. They will be cooked through when you boil the wontons. I love this soup!! It’s delicious!! In step 2 of the Filling directions it states “coarsely chop the ginger and garlic.” Garlic isn’t listed in the ingredients? My grandparents were from Macau & we have many, many relatives still living in that region. The wonton filling my mom & I have always made included garlic; maybe a personal preference . The family getting together to make & fold dozens of these little treasures for special occasions is a happy memory; a team effort approach is definitely best, getting us all to the table to devour them that much faster 🙂 The last time I made deep- fried wontons for a holiday dinner several family members were hovering over my shoulder at the stove the entire time, lol! The detail you give with instructions, explanations, phototutorials, & videos of your excellent recipes is much appreciated! 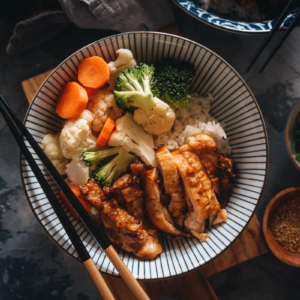 I still consider myself a novice at Chinese cooking, but we’re blessed with several very good Asian grocers here so I’ve been working to expand my skills & recipe range to bring my two sons into this part of their heritage. You’ve really helped me with this & I greatly enjoy your website — a deep & sincere Thank You for all the work & time you put into sharing your knowledge ! Hi Trish, sorry about the typo! I think I meant “green onion” (I’ve edited the recipe). Growing up in north China, my mom usually doesn’t include garlic in the filling. Although you can totally add some if you like the taste (2 cloves in this recipe).